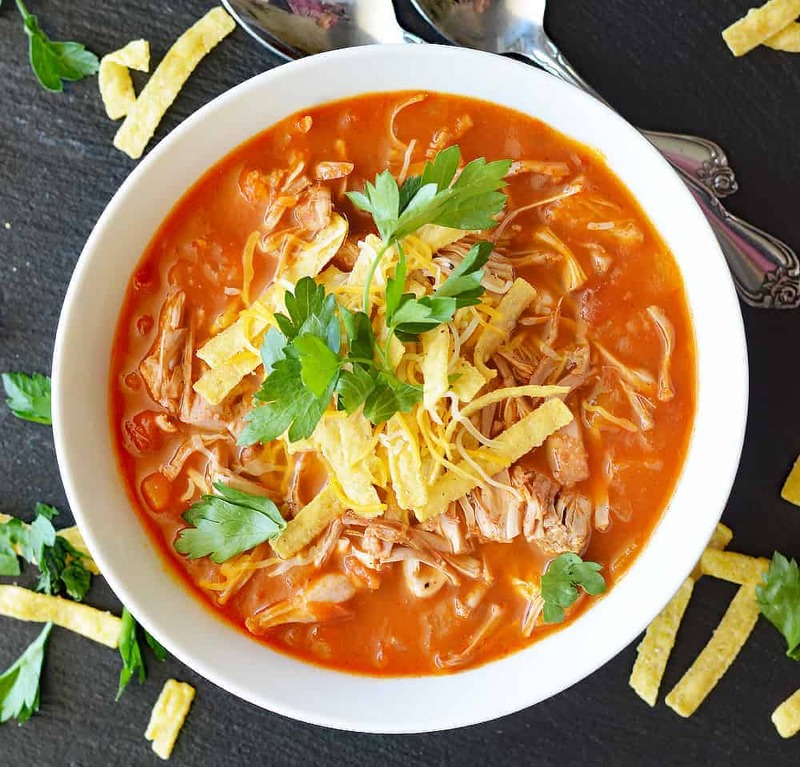 You will love this colorful and flavorful Homemade Jackfruit Tortilla Soup! This recipe comes together really quickly so it’s perfect for a weeknight meal. 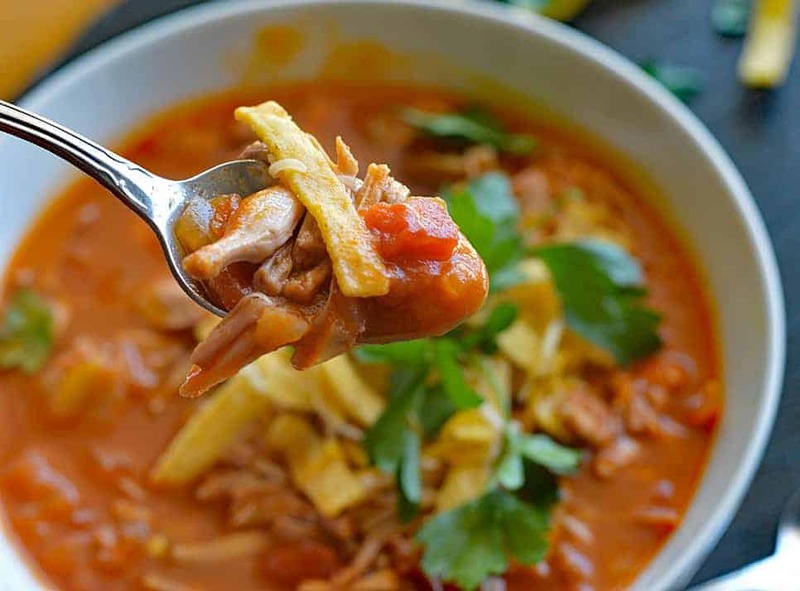 We are, of course, replacing the traditional chicken in this soup with jackfruit to make it vegan. This canned fruit has very little flavor on its own, but takes on the flavors you add to it. It shreds and is a fibrous, starchy fruit which gives it a nice texture. You may have seen it used for a pulled pork substitute for its superb shredding ability. Rather than use two forks or a masher, I like to use my fingers to shred the fruit after it’s drained and rinsed. You’ll see the wedges on the “v” shaped end are more solid and the tops more ruffled. With two hands, I simply press the v-shaped end and it looks like this first picture. I season it and cook over medium high heat until you get some browned edges. 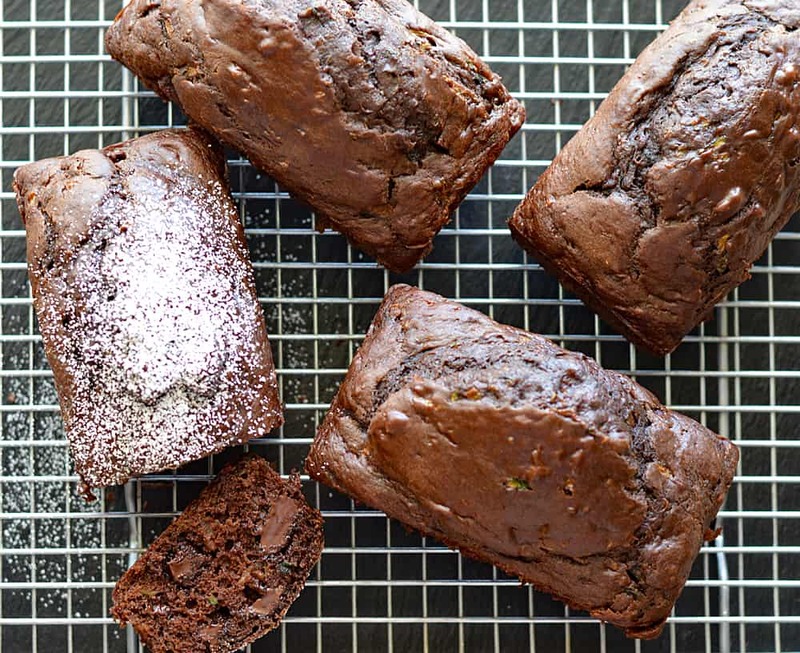 Remove from the heat and you are half way through this recipe! The rest of the soup comes together in a large stock pot. Sauteed onions, diced tomatoes, tomato sauce, diced green chiles (I used mild) and garlic. 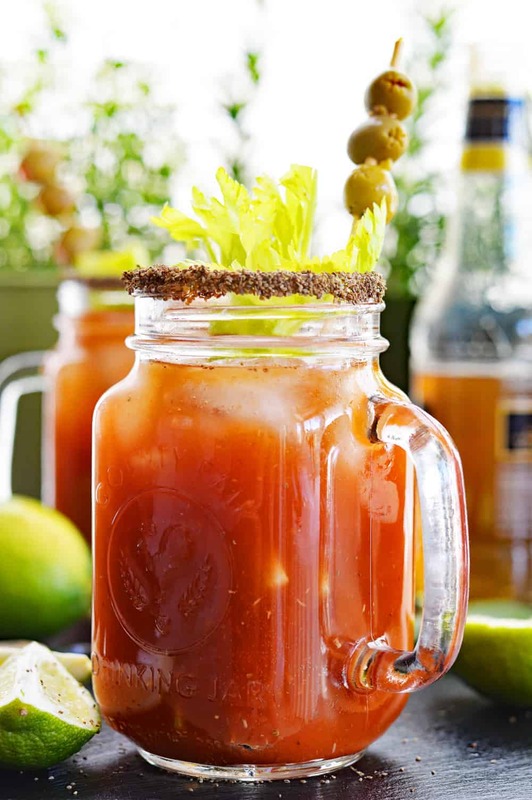 If you like it more spicy, feel free to add a chopped jalapeno. Lastly, to make this a soup, I add a rich vegetable broth. Bring to a boil. reduce heat and simmer uncovered until slightly reduced then add your cooked jackfruit. Just before serving, add a squeeze of lime juice, some cilantro (or parsley if you are like me and think cilantro tastes like soap!). 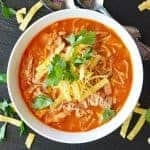 Top the soup with vegan mexican blend cheese, tortilla strips (or broken up tortilla chips) and a garnish of fresh parsley. Feel free to add vegan sour cream or cashew cream. 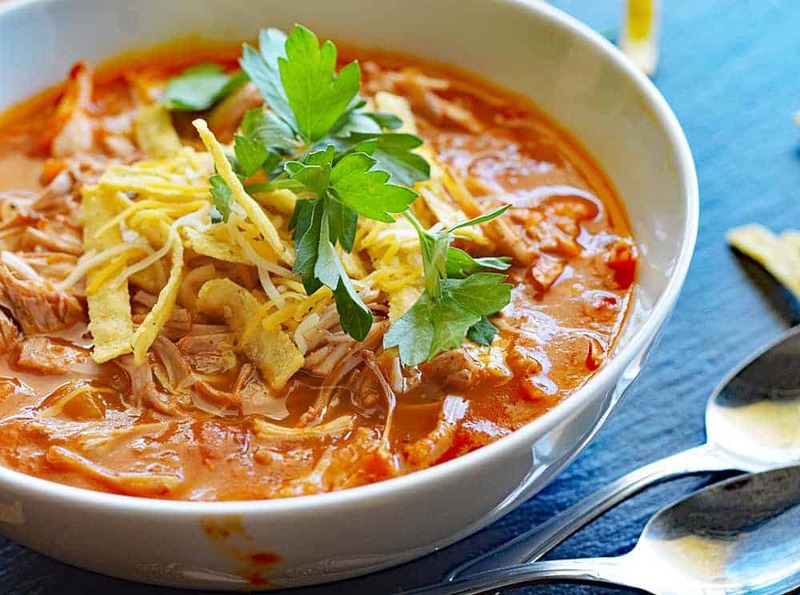 If you made this recipe for Homemade Jackfruit Tortilla Soup, let me know in the comments section below. In a large stock pot, add the oil and onions. Saute for about 5 minutes. Add the green chiles, garlic (jalapeno if you are using it) and cook for a minute or so. Stir in the diced tomatoes, tomato sauce and vegetable broth. Bring to a boil then reduce heat. Simmer uncovered until slightly reduced, about 15-20 minutes. Drain and rinse canned jackfruit. Using your fingers, press the v-shaped end of the jackfruit and pull apart into strips. In a large pan over medium high heat, saute with no oil and season with your favorite SALT-free seasoning if you are using the brined jackfruit. If you are using the jackfruit in water, season salt is perfect. Cook until the moisture is evaporating and you start to see some browned edges. Stir the cooked jackfruit, cilantro (or parsley) and lime juice into the stock pot. Top with tortilla chips, vegan cheese and garnish with more of the cilantro (or parsley). What size was the can of jackfruit you used? I don’t see jackfruit listed in the ingredients list.